EoP Infusion Pump - Perelandra Ltd. When I developed EoP (Essence of Perelandra), it was in response to closing down our on-site open houses (for environmental reasons). I realized I had just eliminated everyone's chance to come to the Perelandra garden and experience a unique body of energy that had been building and refining with nature over decades. EoP contains the electric pattern that is derived from that body of energy. Over the years, people have discovered the wide range of uses for EoP. But today I'm looking at the state of my country and the world and I think it might be helpful for everyone to have continuous access to the strengthening, stabilizing and balancing effect that EoP provides as they move through each day. Now, I could invite all of you to come and hang out in the Perelandra garden each day to get your daily infusion of EoP but that would annoy me and be rather inconvenient for you as you try to live your life. So I asked nature, "How do I accomplish this? How do I give people the benefits of the garden's unique ability to balance, stabilize and strengthen their body, mind, emotions and soul on a continuous basis as they deal with this difficult time in history?" The answer was simple: "Provide a dram-size bottle of EoP for them to keep in their pocket as they move throughout their day. They don't have to take any drops orally. Just carry the bottle in their pocket. The EoP dynamic will move out from the bottle and provide a gentle and continuous flow of stabilizing, strengthening and balancing energy throughout their body environment on all levels for as long as they keep the bottle close." Problem solved. I'm calling this the EoP Infusion Pump. It couldn't be easier to use. Here's how it works. Use as directed! Consider this a tiny pump that continuously infuses EoP into your body's full system. Keep the Solution enclosed in the bottle. No testing for drops and no counting drops. Just carry it in your pocket. No batteries needed. No electricity used. The Pump must be kept close to the body (within 1 inch) in order to effectively infuse the body's various levels and systems. Keep the bottle in your side, front or breast pocket or tied to a lanyard around your neck and tucked inside your clothing. It's useless to you if you carry it around in a purse, backpack, briefcase, lunch box, etc., because it will be more than an inch away and outside the EoP Infusion Pump range of effectiveness. Your EoP Infusion Pump has an indefinite shelf life, as long as there is EoP Solution in the bottle. The Pump does not run on fumes and a promise. It needs to be at least half filled with the actual liquid EoP Solution in order to work. relationship problems such as separation, divorce, trouble with children, relatives, co-workers or friends. If you work in a "sick" building or you are around sick people. 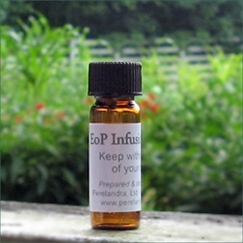 EoP infusion is useful when you are on a trip, especially if it takes you into a different environment with different food and water than what you are used to. And if getting up in the morning and just facing life feels more than you want to handle, the Pump is for you, too. The Pump provides a gentle, continuous infusion of energy that permeates through the glass bottle and into your body's biosphere on all its levels: physical, emotional, mental and soul. IMPORTANT #1: The Pump does not replace the occasional need for the stronger, more direct impact of EoP provided when taking the drops orally. You'll sense when something more is needed. Or, you can simply ask, "Do I need to take EoP orally now?" If the answer is yes, take the drops as directed. But don't stop carrying the EoP Pump in your pocket. This will extend the effect of the drops over a longer period of time. Should you take the EoP drops orally from your Pump bottle, be sure to refill it to at least half full with more EoP Solution. An empty Pump bottle does nothing for you. IMPORTANT #2: Because of the unique stabilizing, strengthening and balancing properties that are part of the EoP Solution, the Infusion Pump setup can only be used with EoP and a human body. The other Perelandra bottled Essences and Solutions will not be effective as a pump bottle infusion. For the best results with your EoP Infusion Pump, you need to follow the directions Machaelle gives below. The more you screw around with these guidelines, the less effective it will be. A key to the effectiveness of the EoP Infusion Pump is that it stays close to your body, within 1 inch. In your front pocket or on a cord around your neck and tucked inside your shirt will work. In a leather pouch hanging off your belt is not the same. It can be glass or stainless steel. Do not use plastic. The container must be clean and cannot have been previously used for anything, including any other Essences or Solutions. It's helpful to label it, "EoP Infusion Pump." The container must hold at least 1/16 ounce (half a dram) of Essence of Perelandra (EoP) Solution. Be careful to choose the stainless steel option. This site offers pill holders in different types of metals. For the EoP Infusion Pump, it must be stainless steel and not another metal like aluminum. You can find all kinds of options on Etsy.com for holders that can be worn around the neck. The direct links change often, but you can go to Etsy.com and search "crocheted necklace pouch" or something similar. Just remember, to get a thin, simple design that will keep the liquid within an inch of your body. If you find other options that you'd like to share, email the information and link to us and we'll post it here. I have been battling depression for a long time due to an illness that I had. I received the EoP Infusion Pump and started feeling uplifted from the depression almost immediately. What a brilliant and wonderful tool from the Perelandra tool box for human wellness and balance. Thank You! Thank You! Thank You! on 9/23/2016 This is great! I started using the Infusion Pump about 2 months ago and it has been a very interesting experience. The biggest & most noticeable difference is that I can handle stress situations a LOT better. When something unpleasant happens or is received by email, it does not 'eat' me up anymore and I am not obsessing about it. I can breathe deeply, be much more objective than in the past and approach a stressy situation, person or communication in a very rational and balanced way. That is sooo awesome & liberating!! I have the pump inside my bra all the time, except shower, yoga and bed! Thanks Machaelle & the Perelandra team! !